Providing access to almost 25,000 rare and often unique books, Early European Books is a key resource for those with a strong research interest in the period from 1450 – 1700, delivering a wide variety of primary sources from one of the most fascinating and influential periods in Western history and has been developed in collaboration with a range of major European libraries. Very few libraries have access to such a large corpus of works as Early European Books offers, and researchers and students will now be able to view this material wherever and whenever they choose. Updated monthly with the most recent edition of the magazine, The Vogue Archive gives researchers of fashion, photography, advertising and history access to the entire publication run of the US edition of Vogue magazine, back to its first issue in 1892. Fashion marketing students will be able to research the history of a brand identity by viewing every advertisement featured, while researchers in cultural and gender studies can explore themes such as body image, gender roles, and social tastes, from the late nineteenth century to the present day. The collection contains over 400,000 pages, reproduced as high resolution full-colour images, along with very rich indexing and metadata. Jisc champions the use of digital services and solutions in UK universities, and working with ProQuest to make these archives available to researchers will help achieve this. Having both of these products available on the one ProQuest platform will enhance efficiency and accessibility, which will benefit both the students and those teaching them. Lorraine Estelle, executive director content and discovery and divisional CEO Jisc Collections, Jisc said: "We are committed to making scholarship as accessible as possible across UK institutions and are thus very pleased to ensure all libraries can have access to Early European Books and the wealth of material it contains. We have long seen the potential of The Vogue Archive to support education across many disciplines – not only those with a focus on fashion – and look forward to it being a well-used resource in higher and further education." Stephen Brooks, senior director for literature and the arts at ProQuest said, "This agreement is great news for researchers and students across a range of disciplines; providing them with access to a vast collection of new, digitised content. We are incredibly passionate about meeting researcher needs around the world and this partnership is a valuable and effective way for us to achieve this goal. 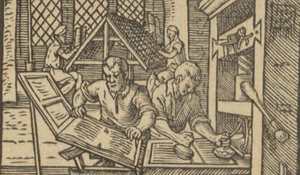 We applaud Jisc for its recognition of the potential for these resources to impact research in the UK and will continue to work closely with Jisc and the higher education community to support its use of Early European Books and The Vogue Archive." To see the press release on this agreement, click here.